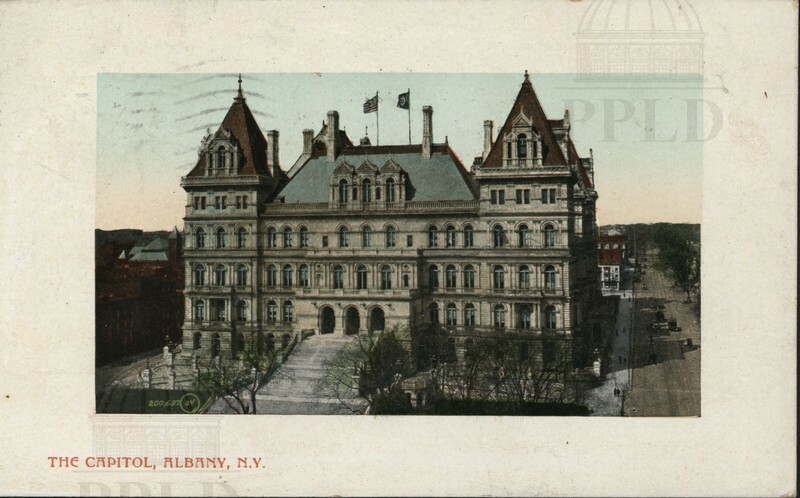 Color-tinted photograph of the state capitol building in Albany. 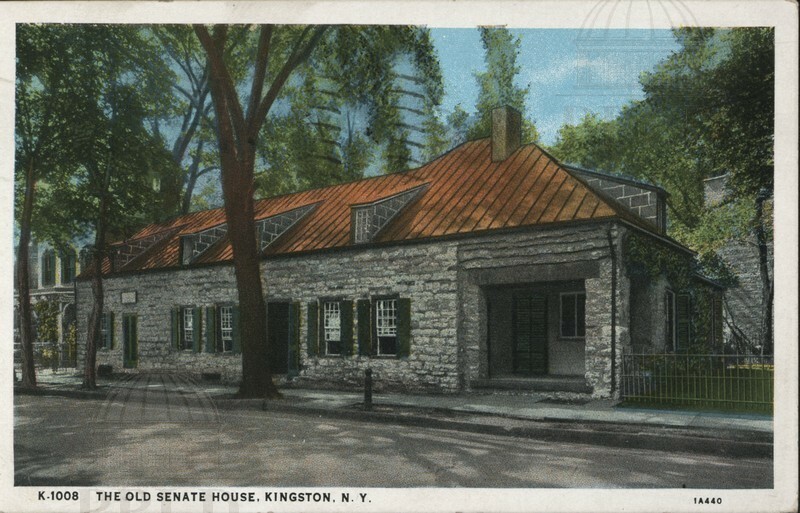 Color-tinted photograph of the Old Senate House in Kingston, Handwriting reads: "Will be down Thursday -Pete." 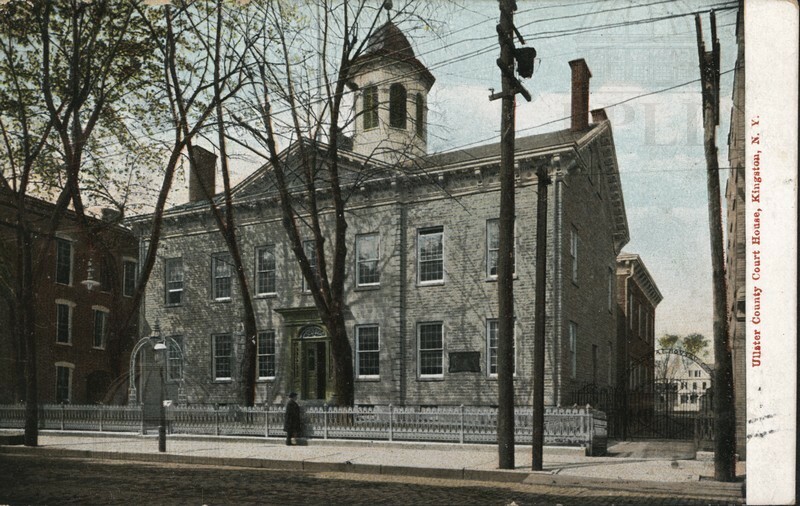 Color-tinted photograph of the Ulster County Courthouse, in Kingston. 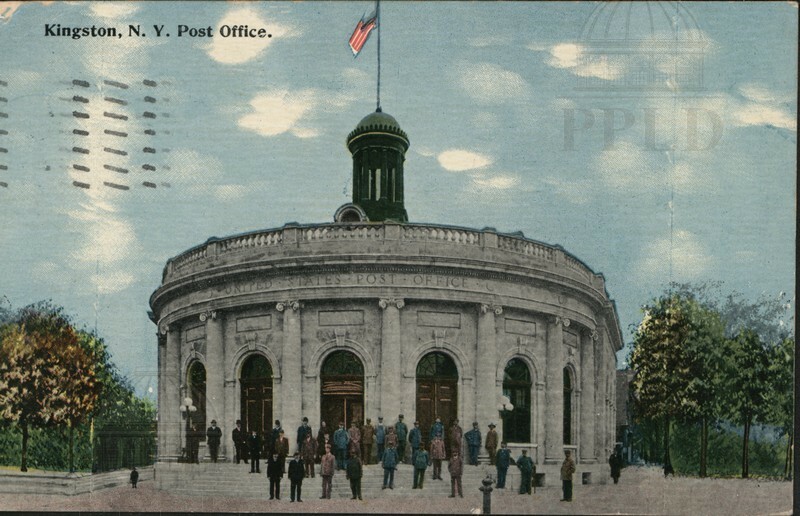 Color-tinted photograph of the Kingston Post Office, with postal workers lined up in front. 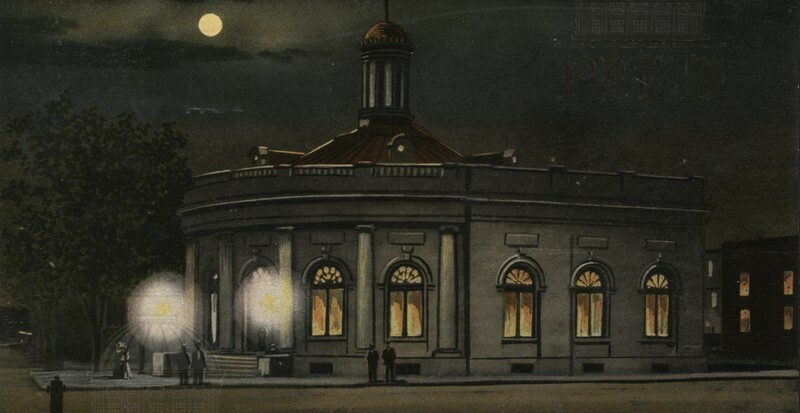 Color illustration of the Kingston Post Office, at night. 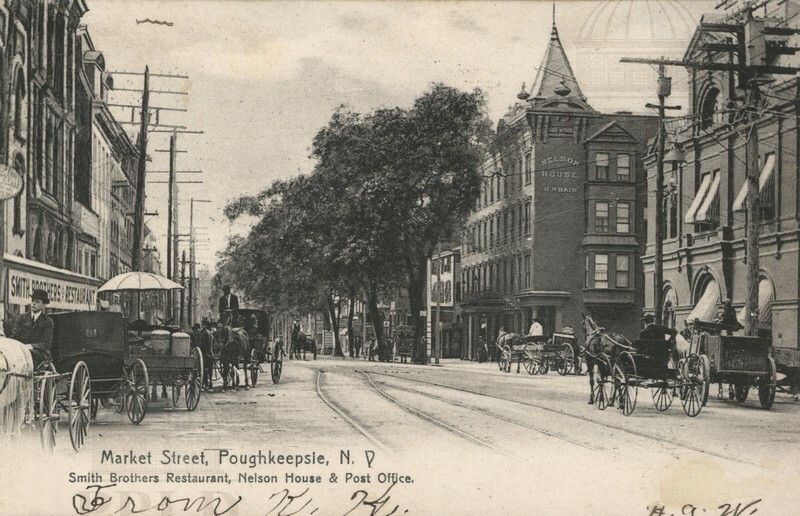 Black & white photograph of Market Street in Poughkeepsie; the Smith Brothers Restaurant, the Nelson House, & the old Post Office are visible. 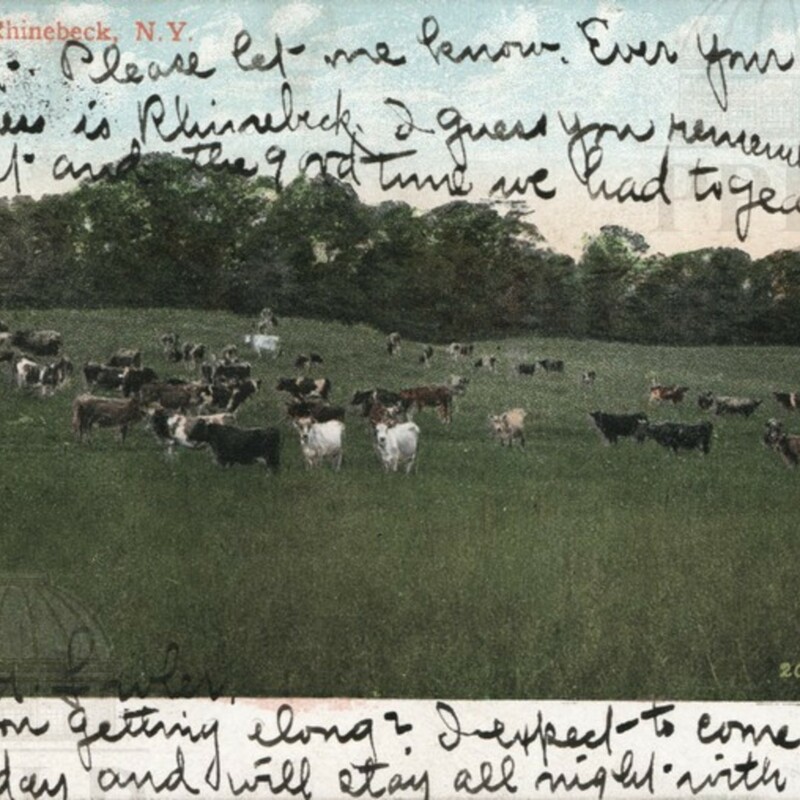 Handwritten at bottom: "From K.K. 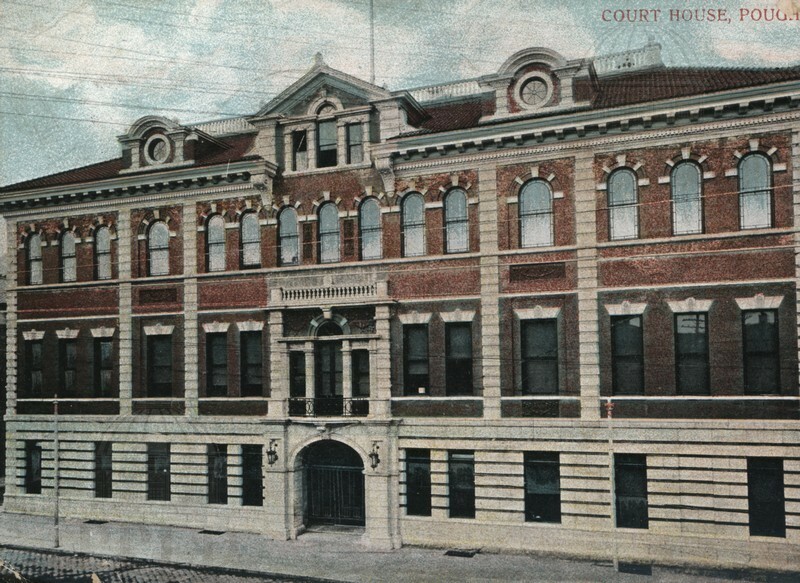 H.G.W." 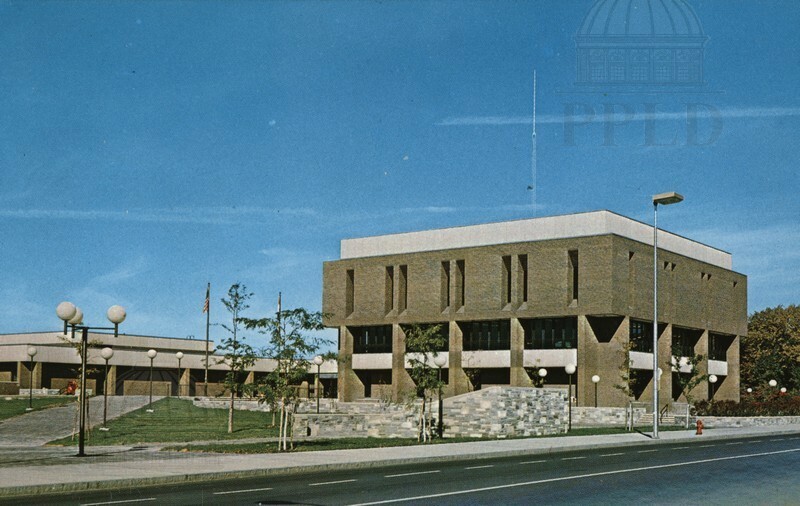 Color photograph of the new Municipal Building on Market Street, built in the mid-1970's. 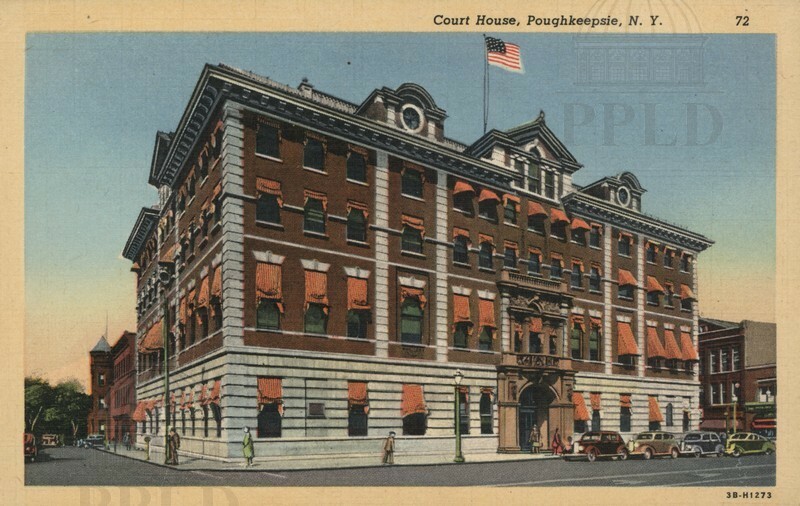 Color-tinted photograph of the Municipal Building in Poughkeepsie. 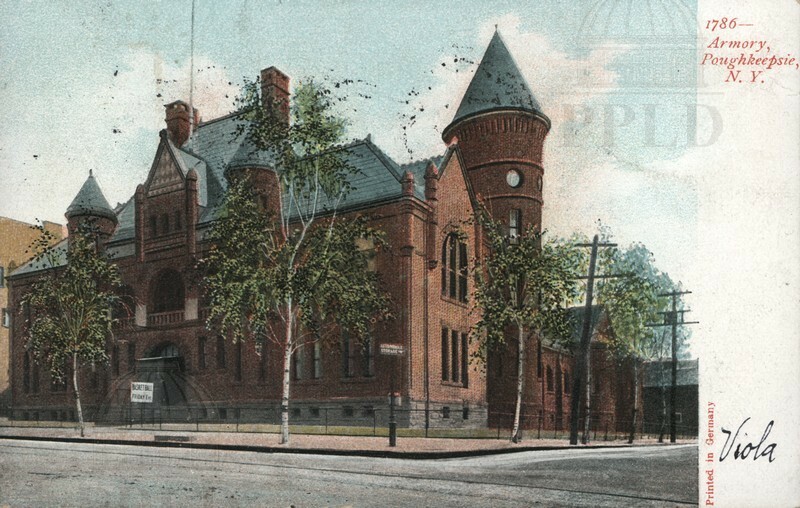 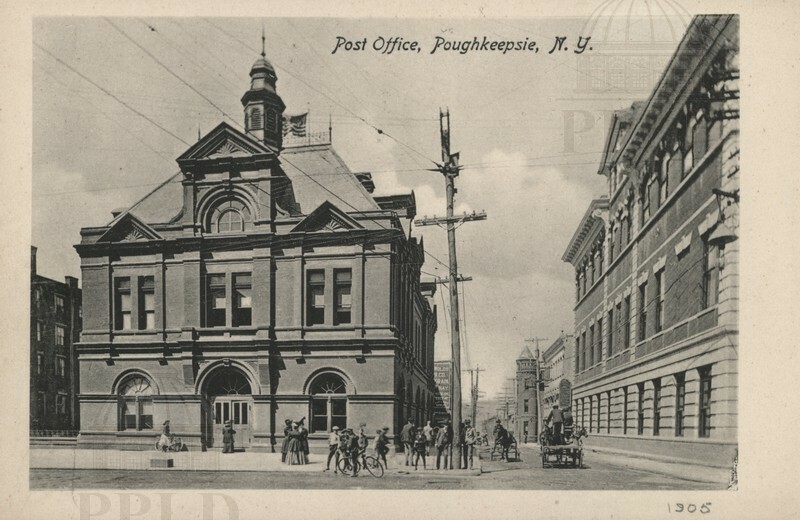 Color photograph of the U.S. Post Office in Poughkeepsie. 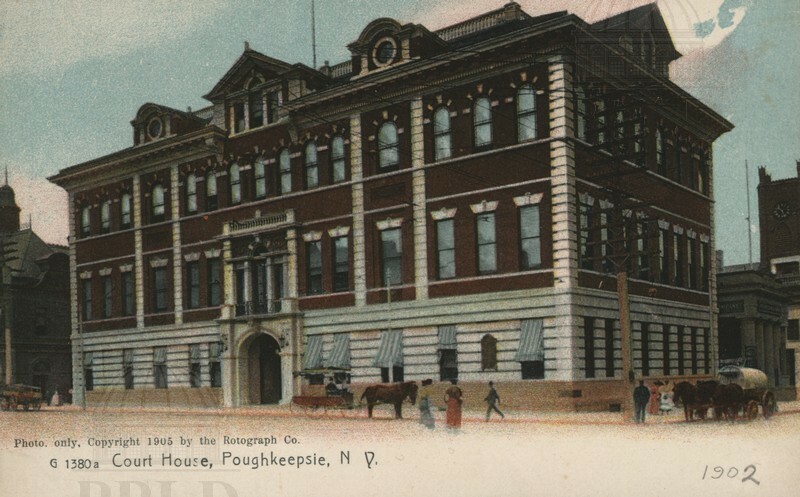 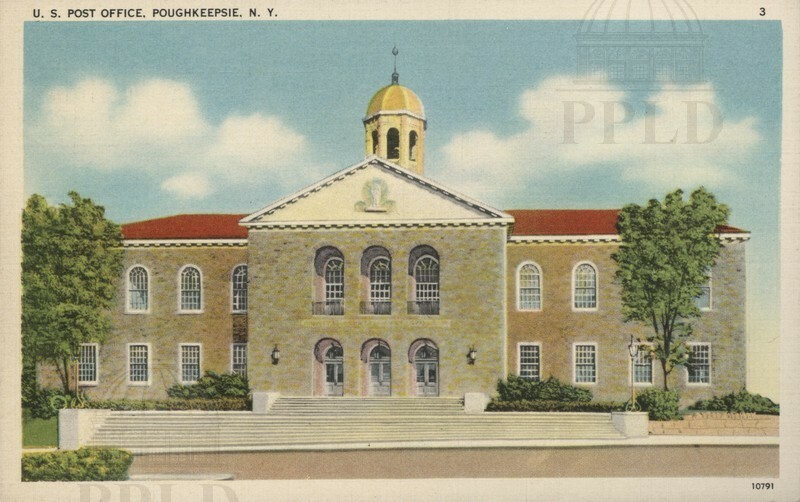 From the reverse: "the name Poughkeepsie is derived from the Indian word of similar pronunciation meaning, 'the reed-covered lodge by the water place.' 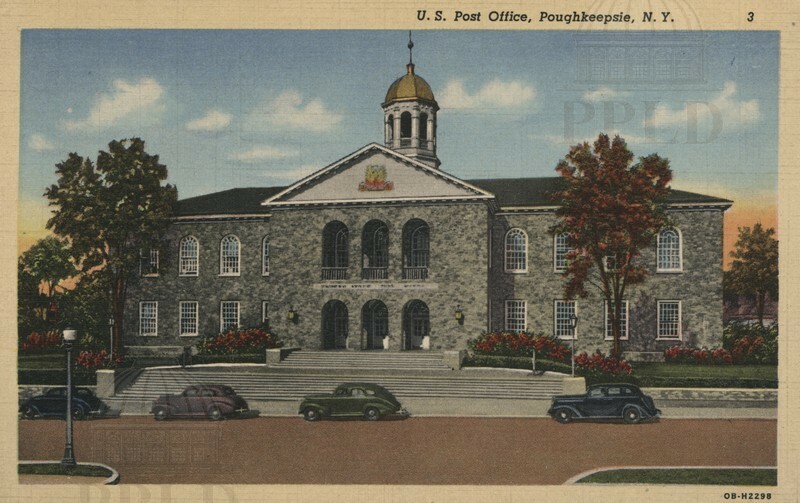 "
Color-tinted photograph of the U.S. Post Office in Poughkeepsie, erected in the 1930's as a WPA project. 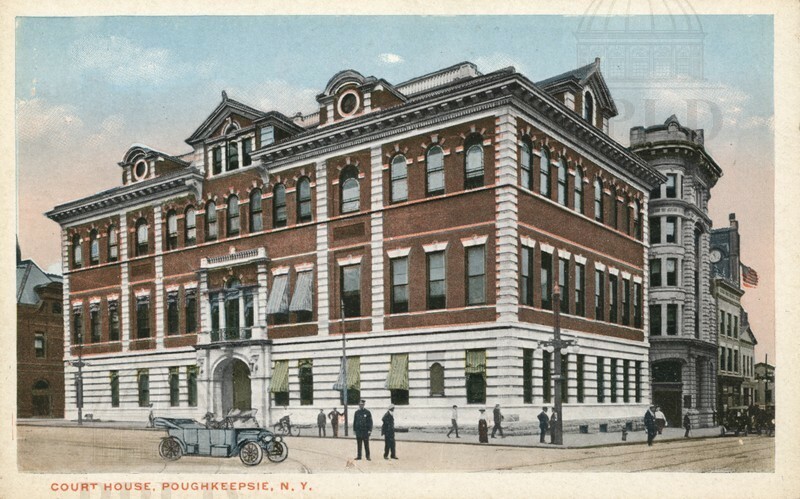 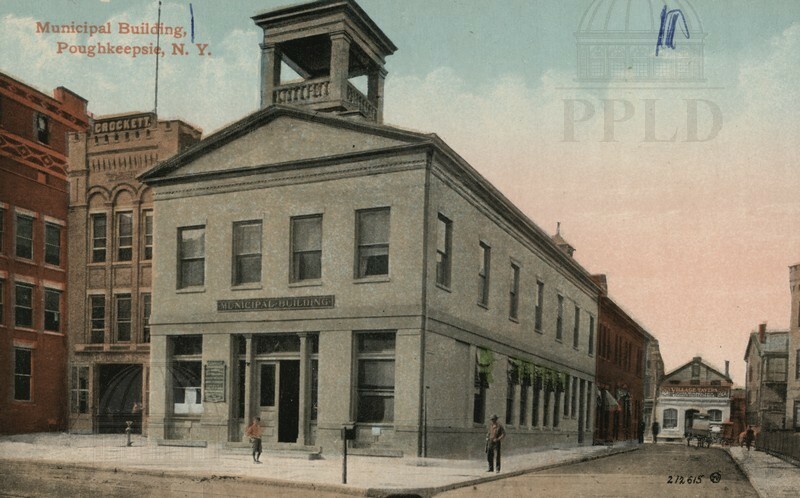 Color-tinted photograph of the old Post Office in Poughkeepsie. 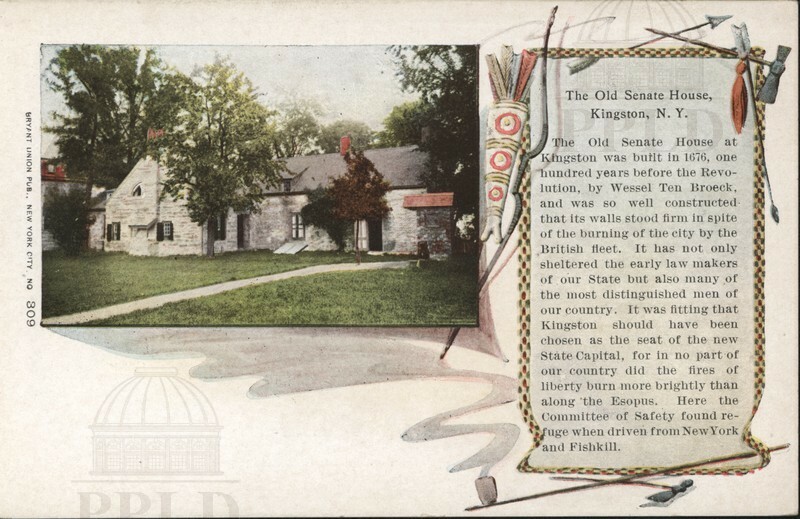 Handwriting at bottom reads: "I received your postal Thanks. 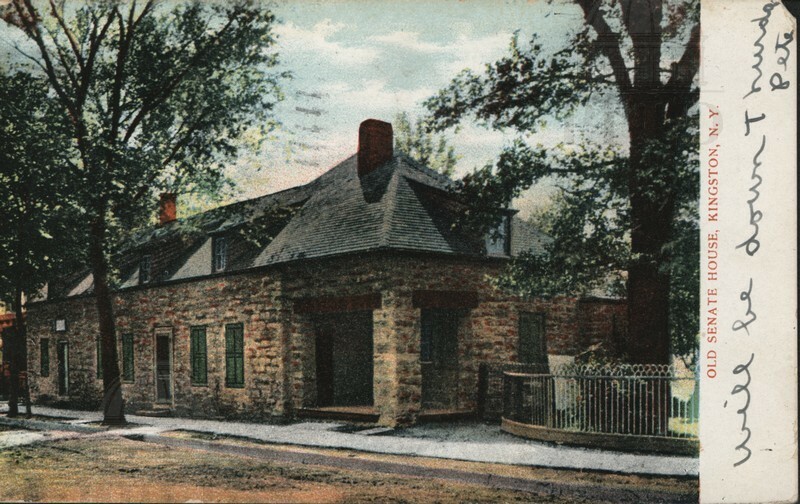 Katie." 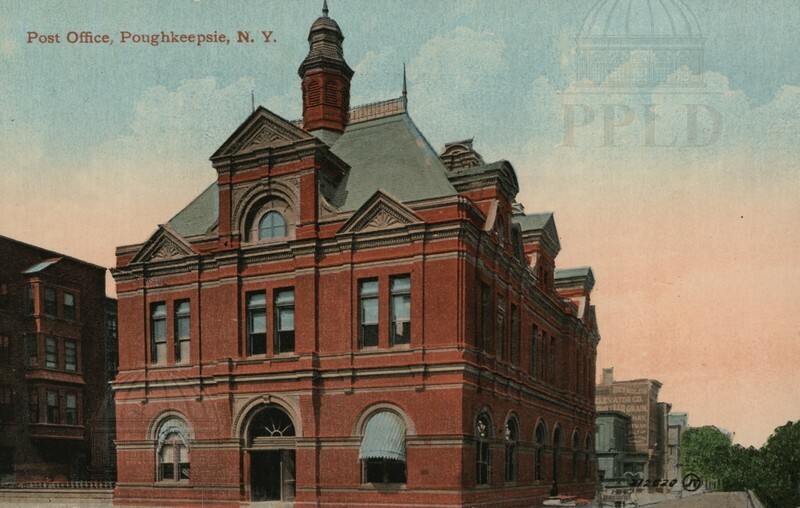 Color-tinted photograph of the old Post Office in Poughkeepsie. 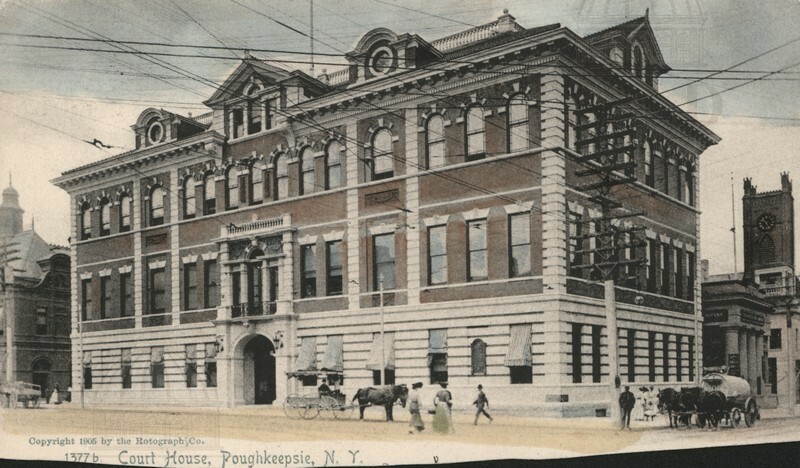 Black & white photograph of the old Post Office in Poughkeepsie. 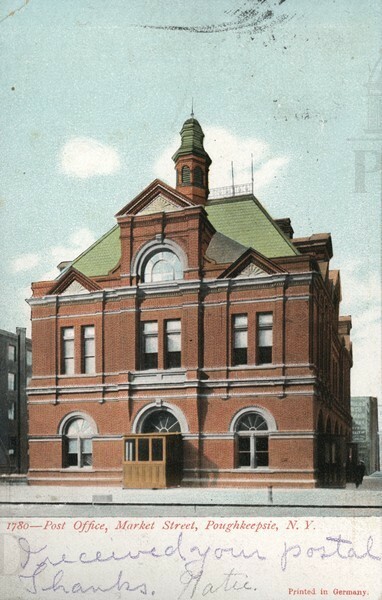 From the reverse (typewritten): "Post Office building erected in 1886." 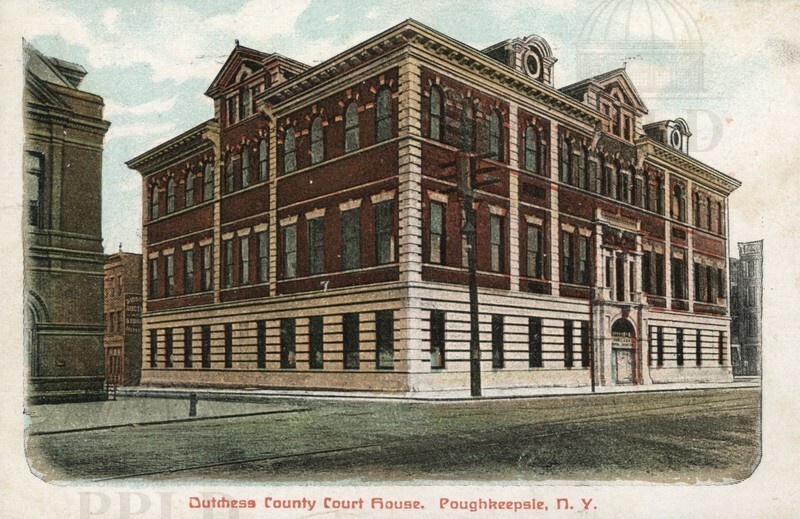 Color-tinted photograph of the Dutchess County Courthouse on Market Street in Poughkeepsie. 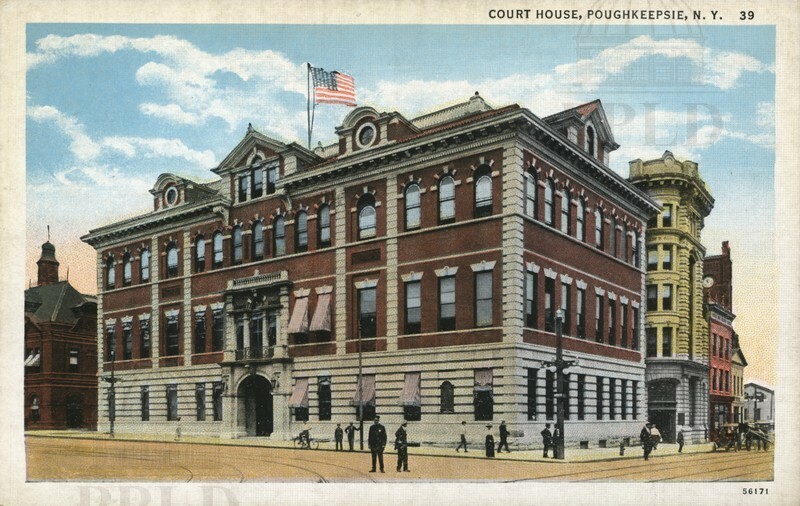 Color-tinted illustration of the Dutchess County Courthouse on Market Street in Poughkeepsie. 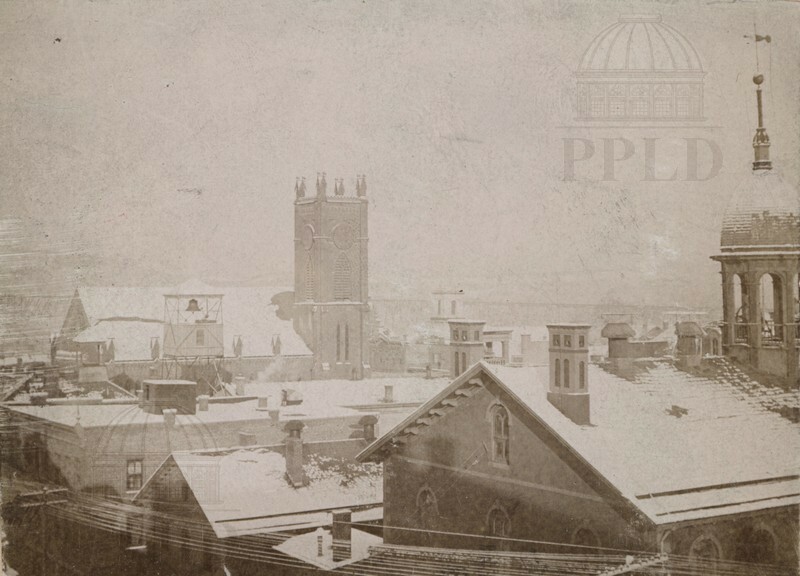 Sepia-toned souvenir photograph of the rooftops of Poughkeepsie in winter. 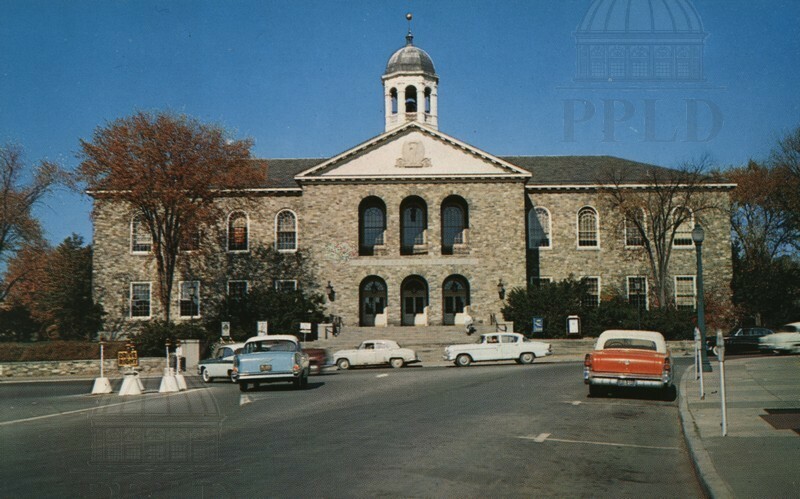 Reverse reads (handwritten): "City Hall-foreground--Reformed Church-background. 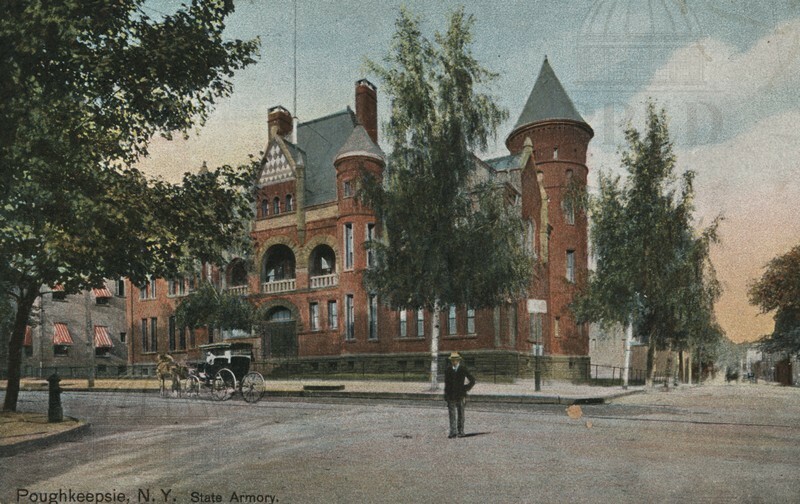 About 1900." 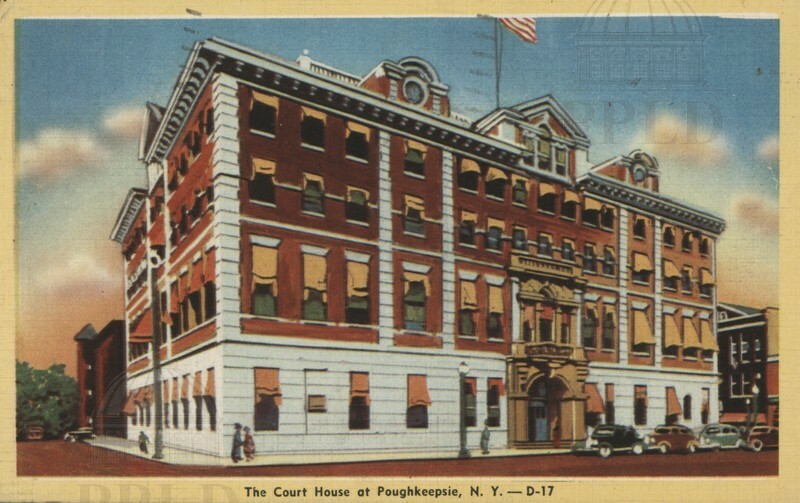 Reverse is 775-2PC5. 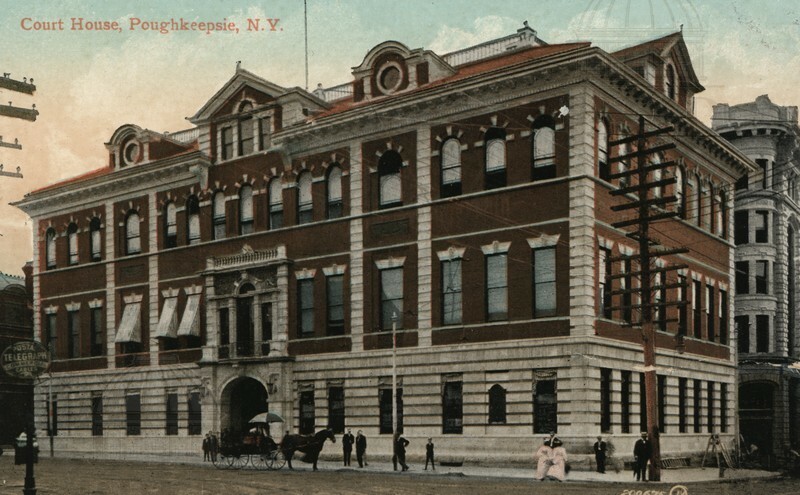 Color-tinted photograph of the New York State Armory on Market & Church Streets in Poughkeepsie. 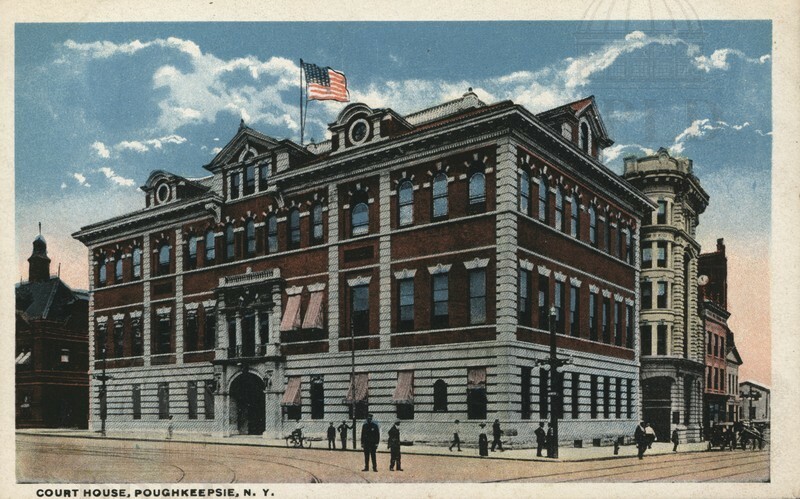 Color-tinted photograph of the New York State Armory on Market & Church Streets in Poughkeepsie. 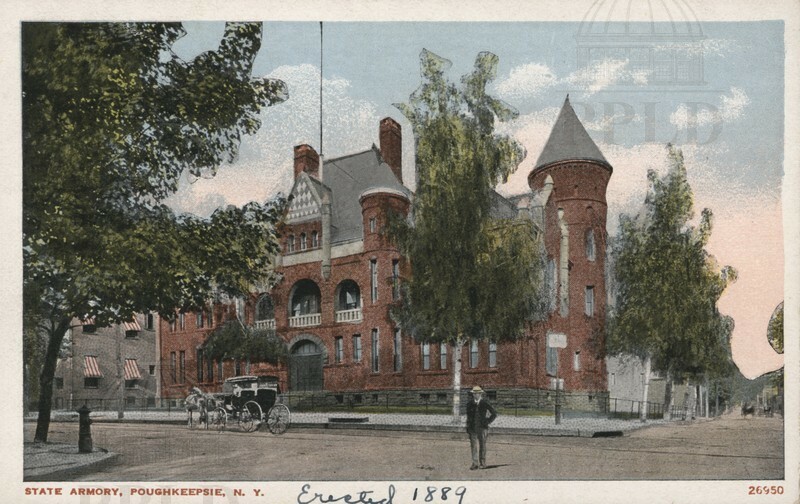 Handwriting at bottom reads: "Erected 1889."